More to the point of this post, though, I offer a second autobiographical anecdote: I had the very good fortune of engaging a serendipitous conversation, just a few days ago, in which I overheard something spilling from my own mouth that I had not, prior to that moment of articulation, made thetic to myself. Some academic friends and I were discussing the recent events in Ferguson when one of my (for lack of a better descriptor) more "radical" colleagues conjectured (and this is roughly a direct quote): "In the face of unjust, militarized police violence like [what was happening in Ferguson], the only effective response is for the opposition to take up arms." To which, I replied: "But that is exactly what the people protesting on the streets in Ferguson did! They quite literally took up their arms!" Of course I knew that what I meant by "taking up arms" was not the same as what my interlocutor meant by "taking up arms"; it wasn't even in the same ballpark, really. But, only as I said it aloud, I realized that there was something like a long-forgotten moral truth to what I was saying (and meaning) from which I had been long distracted but about which I remained deeply convicted. At the risk of personally anecdotal-izing my surprise insight too much, I would be remiss not to acknowledge that I was raised in the city that houses the National Civil Rights Museum, in the very same location (the Lorraine Motel) where Dr.Martin Luther King, Jr. was assassinated, so the "philosophy" of nonviolence has never, ever, not been a part of my formative experience as a moral agent. I am, for the most part, a product of the cushy, consumerist, mostly-peaceful and -profitable Clinton years,which means that my formative years were concurrent with what was, for the most part a nonviolent and nonrevolutionary political era, the end of the (so-called) Cold War, the end of apartheid, the progressives' victory in U.S. domestic Culture Wars and the global adoption (by force or volition) by most states of fundamentally democratic principles. One of the first and most influential (non-Philosophy) books I read when I began graduate school was Jack DuVall's A Force More Powerful (also now a film, a game and an internet resource archive), which chronicled the literally world-changing influence of nonviolent protest/progressive movements and argued for not only the morally and politically coercive "force" of nonviolence resistance, but its practical and effective force as well. And, again for whatever it's worth, throughout that time-- and perhaps largely as a product of that time-- I have never been able to shake my moral-intuitional aversion to violence as an preferred means for negotiating or resolving conflict. Even still, in my lifetime, I had not yet been party to a home-grown experience of the force of nonviolence so effectively deployed as it had been in the chronicles of 20th C. history by which I had been formed and with which I was so familiar. To wit, my intuitional commitment to nonviolence remained, even and despite myself, merely theoretical. Yet, take a moment to think on (as I often did) the accomplishments of nonviolent force in the 20th Century for a moment: the 1919 March 1st Movement in Korea and the Egyptian Revolution of the same year, the nonviolent movements of the First and Second (and continuing) Intifadas in Palestine, the Irish non-cooperation movement of 1920, the Occupation of the Ruhr, the Danish Resistance Movement of 1940-43, the Norwegian Resistance Movement of 1940-45, the extended Defiance Campaign during the South African apartheid years, the African-American Civil Rights Movement and the Chicano Civil Rights Movement in the mid-to-late-20th Century United States, a number of the worldwide protests of 1968, the Iranian Revolution of 1979, the Solidarity Movement in Poland in 1980, the Peoples Power Revolution in the Philippines 1986, the 1989 Tiananmen Square protests in China , the Czechoslovakian Velvet Revolution, the 1990 Monday Demonstrations in East Germany, the Mass Action for Peace by the women of Liberia in 2003, Ukraine's Orange Revolution in 2005, the Egyptian Revolution and the Syrian Uprising and the Bahraini Uprising of 2011, Yo Soy 132 in Mexico begun only 2 years ago and continuing still, None of them were completely or "purely" nonviolent protests/movements but, in every case, without exception, none of them could have achieved any of the gains they achieved without the force of nonviolence. 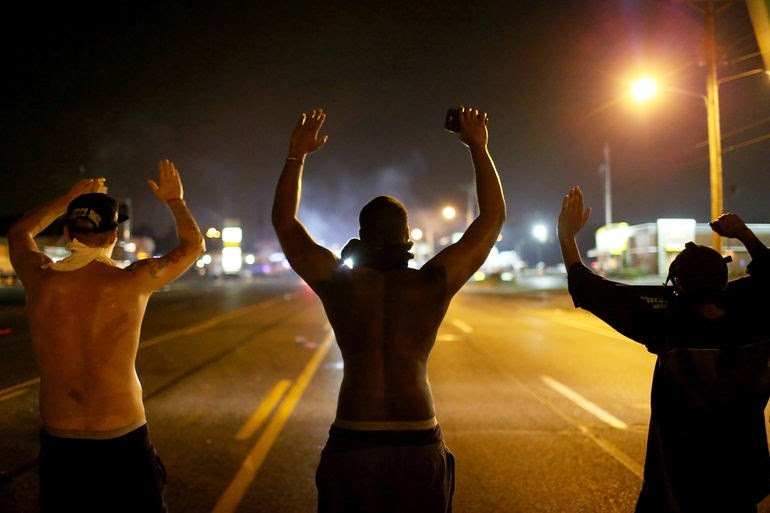 I had not seen anything of that ilk, I thought, in my lifetime, in my country... until Ferguson. 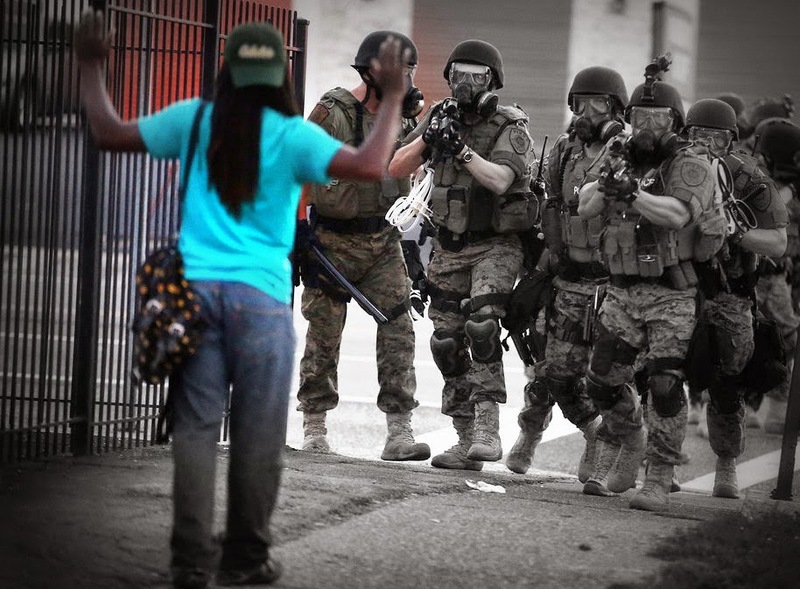 That is, until I saw unarmed, peaceful protesters take up their literal arms in an incredibly powerful display of powerlessness, defenselessness and vulnerability-- in the face of an overwhelmingly violently "armed" (in fact, militarized) police force-- and demand little more than what counts as a minimally decent response to aggression: DON'T SHOOT. 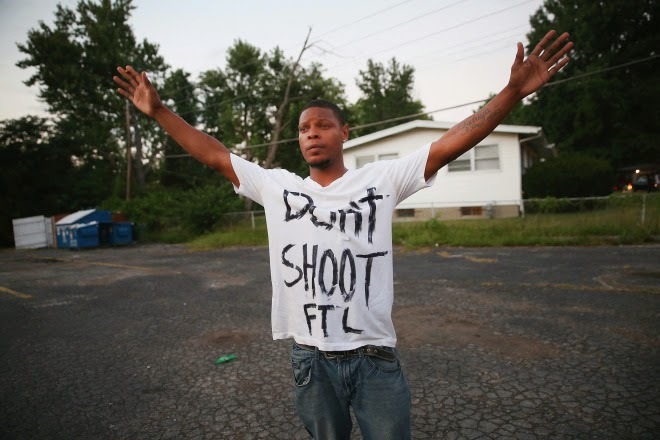 There are many lessons to be learned from Ferguson, to be sure. I just want to remind us that one (among many) of those lessons, one that I think was powerfully demonstrated in Ferguson's "Hands Up. Don't Shoot." strategy, is that there are other, non-obvious and nonviolent, ways to forcefully "take up arms" against unjust and oppressive regimes. Raising one's hand against violent aggressors, making manifest one's vulnerability and powerlessness and, in the act of doing so, implicitly or explicitly forcing one's antagonists to not only show their aggression as aggression, but also to justify their aggression as just, is in the very best (i.e., non-pathological) sense of the term passively aggressive. I remain, as I said at the beginning of this post, unresolved in my own mind with regard to when it is advisable, prudential or, most importantly, moral to choose violent force over nonviolent force, but the actions of the nonviolent protesters in Ferguson have given me pause to reconsider not only the incredible risk and difficulty of opting for nonviolent force but also the fundamentally philosophical basis of conceptually figuring nonviolence as (in the words of DuVall) a "force more powerful." As I've discussed at length on my own blog before in re my work on "Weak Humanism" (read here or listen to me talk about "Weak Humanism" here), I worry our default commitments to both classical and neo-liberal conceptual apparatuses have effectively (and regrettably) blinded us, to our own detriment, to the manner in which we are primarily joined together not by our strengths or positive capacities -- even less so by our capacity to evidence our strengths by force or violence-- but rather by our vulnerability, mortality and mutability, capriciousness, imperfection, helplessness (or, rather, our fundamental need for help) and weakness. That is to say, what distinguishes us as the curious animal we human beings are is not only our weakness-- a characteristic that attends all finite and mortal organisms-- but also our capacity to reflectively take account of ourselves as finite, mortal and interdependent organisms, to make that fact thetic to ourselves, and to formulate for ourselves (moral/political) laws that aim to protect the most vulnerable among us, for the sake of all of us.